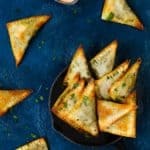 These Mushroom French Goat Cheese Mini Empanadas are simple and delicious! Fancy yet no-fuss. They’re the perfect little appetizer for any celebration. Add onion and sauté until soft, about 3 minutes. Add garlic and sauté for 1 minute. Add mushrooms cook until they tender and start to turn golden and fragrant. Season with salt and pepper to taste. Add parsley and mix to combine. Remove from heat and let cool. Preheat oven to 375º F. Line a baking sheet with parchment paper and spray with oil. Set aside. Lightly brush edges of one wrapper with water. Place 1 heaping teaspoon of mushroom mixture in center of a wrapper and top it with one small piece of President Palet de Chèvre. Fold wrapper over filling, pressing edges with a fork to seal. Repeat with remaining wrappers. Arrange empanadas on prepared baking sheet. Spray tops of empanadas with oil. Bake for 10 to 12 minutes on top rack of oven until crisp and lightly brown. You might need to bake these in batches. Each large baking sheet holds up to 12 – 15 empanadas. I cut President Palet de Chèvre into 12 triangles and then I cut each triangle in half. The wonton wrappers are easy to work with. You can found them in the refrigerated section of most grocery stores.